G37 coupe and baby seats! The whole premise for me getting a coupe was my long commute that I drive alone. Of course right after I get the coupe my wife leaves town for 4 days and all I do is run around w/ my 16 month old daughter. We had a blast. Here's what I learned. 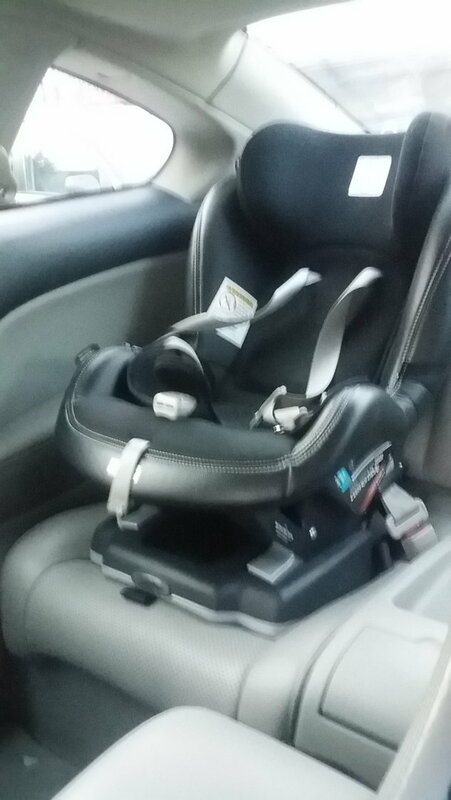 Her rear facing infant seat fits fine, I tested this before I bought the car. It has an optional base. With the base she is nice and level but the front seat has to be moved pretty far forward. 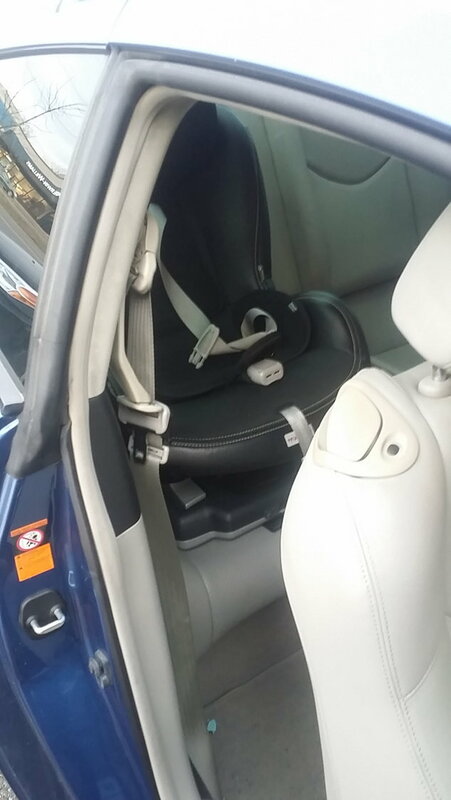 Without the base the infant seat has more slope to it than desired. It makes her sit more upright and is more awkward for her if she falls asleep. I'd only want her like this on short trips but not using the base means a normal sized adult passenger can sit in the front seat w/ legroom to spare. Loading her in the car isn't but it does take longer than a 4 door vehicle. It's easier to transport a toddler in this car than a cup of coffee. How are the cup holders so bad? They do hold baby bottles and sippy cups though. For a rear facing infant seat you need to have a baby "curtain" or dark windows. Our F150 has dark windows so I've never used one of those baby curtains. The rear glass of the G is almost horizontal so the sun was in my daughters eyes a lot. Luckily her car seat has a sun shade and I had to use it more than ever before. I'm getting the windows tinted 15 or 20% next week and I think I'm going to pony up for the ceramic film to help keep the car cooler since I have a black interior. I should have taken photos. I'll try and get one tomorrow. Just wanted tonadd to this thread as it was instrumental in deciding to forgo the sedan for the coupe. I have 3 year old, its just me and her most of the time. My worry was that she frequently gets in by herself but has trouble with the buckles. I purchased the Peg Pereggo convertible seat and it works quite well with both seatbelt and the latch system. It is heavy as hell and I just leave it there permanently. It has worked out well and what i couldnt gather from previous posts is that i can reach the car seat buckle from outside without fuss. I included some pictures for future buyers. I do not have passengers outside of my kid, so i leave the front seat in its lowest setting, as far ahead without blocking my side mirror and remove the headrest. This has worked out so far. My kid is tall though and the Peg Pereggo while being very hefty has a large base which increases ride height. So she is literally two inches from the top of the glass. This might not be my long term option (car or seat...). Note the natural napping position! 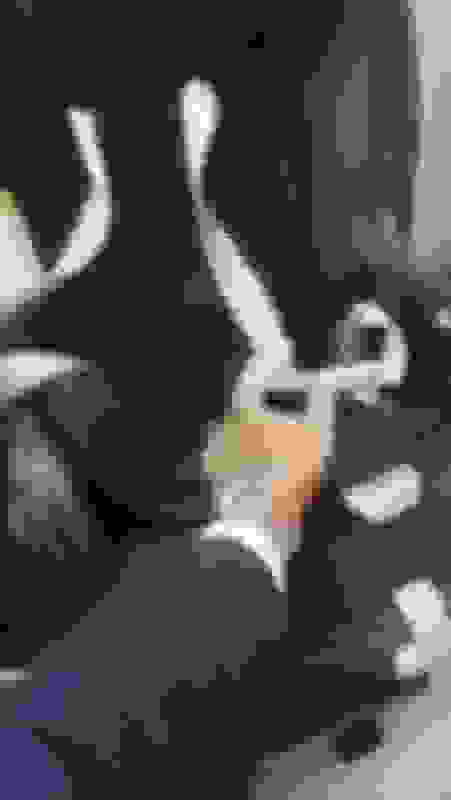 Last edited by Decaf; 01-28-2019 at 06:13 PM. Just as a data point, I have a 7 year old with a Britax convertible seat. The movable headrest portion (the part that moves the shoulder straps up and down) was only 2" away from the glass in the Coupe. Add an Amazon link, Decaf. Thanks for the worthy contribution. Haven’t even tried since the G is just the racecar. But might give it a try today for emissions, hoping maybe if I go with a grumpy baby they’ll give me pity and not flag my car telling me I have to return it to stock. Quick Reply: G37 coupe and baby seats!